Today we want to highlight one of our most recent catches. 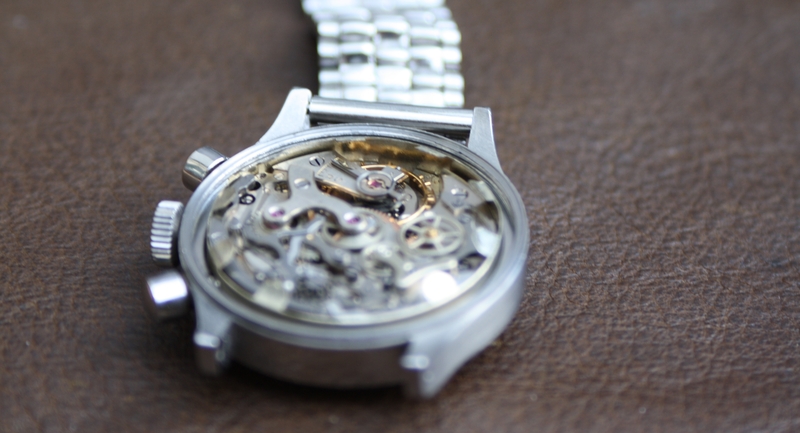 As many of our regular customers know we are always on the hunt for the best vintage chronograph watches. 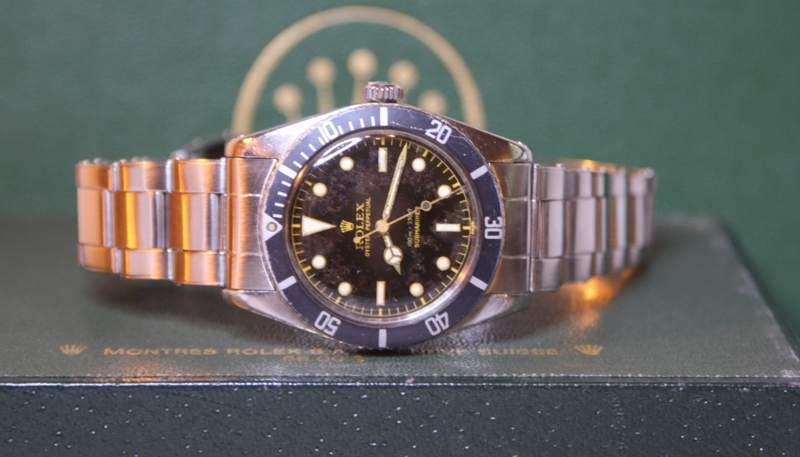 Of course we like the well known brands however we have the same interest for watches which are just extremely rare and beautiful like our latest catch. This beautiful and well preserved Leonidas step case chronograph has a case made of stainless steel with pump pushers and a screw back case. The watch has a beautiful silver dial with Radium indexes. The untouched radium hands are pristine as well. The 2 register dial is amazing with the dark brown indices and outer minute track in silver. 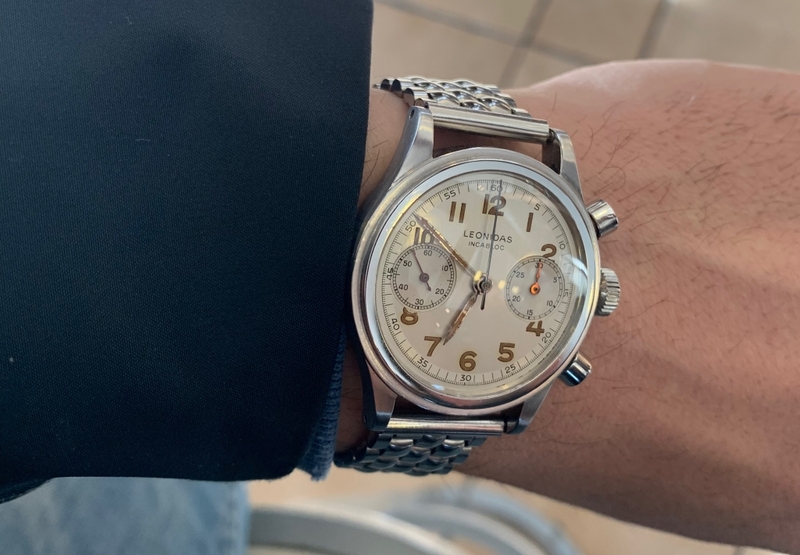 The stepped steel bezel looks extremely attractive and reminds me of other high-end chronograph watches from the 1930’s like the Longines 13zn stepcase flyback chronograph and Vetta Ermetico. 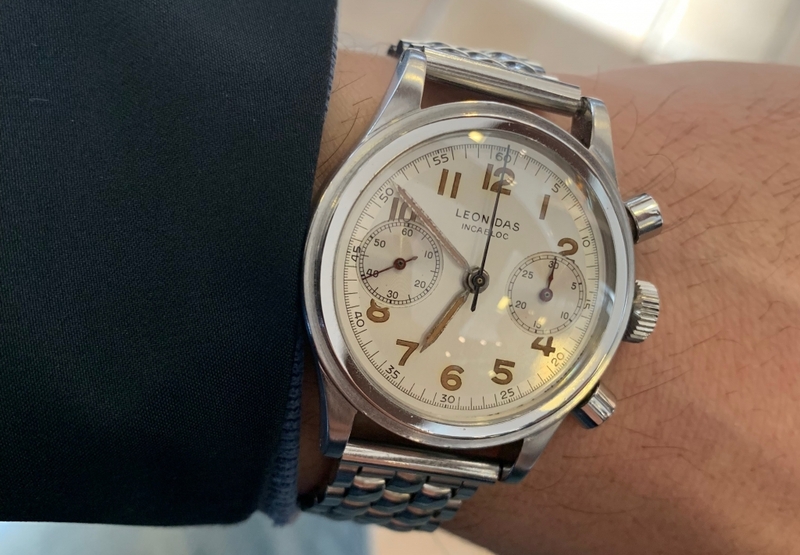 Apparently the Leonidas watch company produced this step case chronograph in a very limited amount as this is the first example on the market till now. 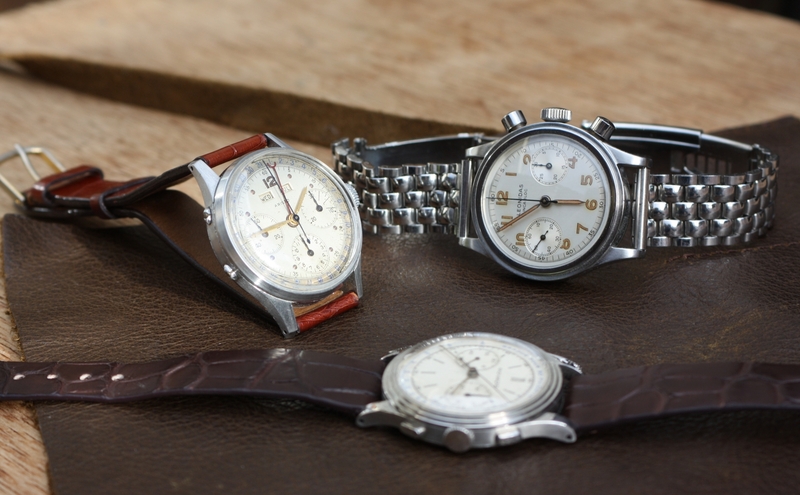 Various chronograph watches are inspired on the early stepcase models. To find a well preserved example is extremely hard these days. The case shape has a robust design, the watch could be considered as a real toolwatch chronograph. It has a very robust case and shock resisting movement for the age, many of these watches have seen action in the military. 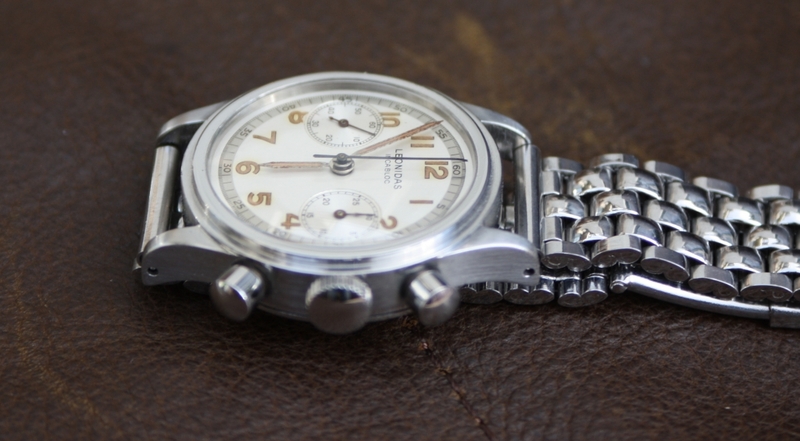 As seen in the pictures this Leonidas step case chrono has a prestine dial. This is rare, especially for a dial exposed to high radiation from the indices and hands. The quality of the dial must be very good as the lacquer as pretty much untouched by the radiation of the hands. 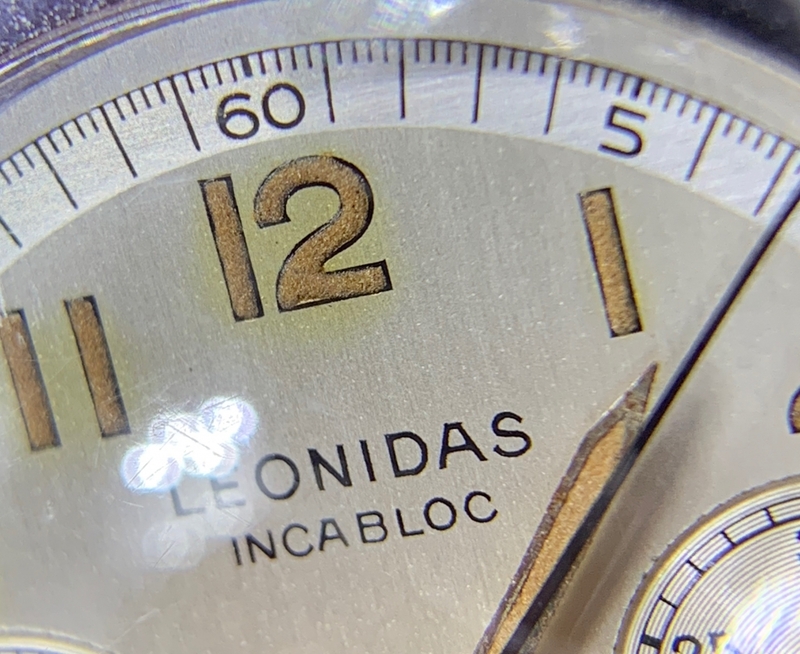 Around the hour marker little ‘radium burn’ is visible under a loupe, this is very common for watch dial’s from this period. Finally the watch is fitted on a steel Gay Frères bracelet from my own collection which is the perfect match with a stepcase chronograph in my opinion. This watch could be fitted on any bracelet as it’s looking gorgeous all the way. The chronograph hands are made of blued steel and change color when turned into the light. It’s e phenomenal watch, a real vintage treasure. Are you looking for a vintage chronograph or are you selling a similar example contact us by phone, mail or the contact form below. For our full collection vintage chronograph watches go to our shop. 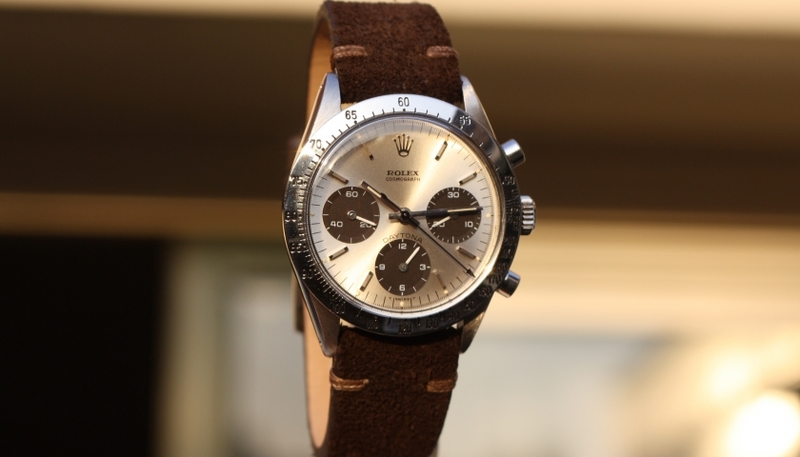 Rolex Daytona verkopen, kopen of laten taxeren. Uw oude Rolex is geld waard !